SEATTLE (AP) Charlie Morton did what’s become expected on the mound in getting his 12th victory, while Evan Gattis and Josh Reddick provided the pop needed with all the big names missing from the Houston Astros‘ lineup right now. Gattis hit a two-run home run to put Houston ahead, Reddick capped it with a two-run shot in the ninth inning, and the Astros snapped a five-game losing streak with a 5-2 win over the Seattle Mariners on Tuesday night. Already without Jose Altuve and Carlos Correa, the Astros lost George Springer for most of Tuesday’s game with a sore shoulder. Gattis’ 21st home run of the season came in the sixth off Seattle starter Mike Leake and snapped a 1-1 tie. Leake left a breaking ball in the middle of the plate and Gattis clubbed it over the left field fence to put the Astros in front. Reddick greeted new Seattle reliever Zach Duke with a shot to deep right-center field in the ninth. It was the first home run allowed this season by Duke, who was acquired in a trade with Minnesota. Morton (12-2) struck out eight and didn’t allow Seattle to put together a sustained rally. 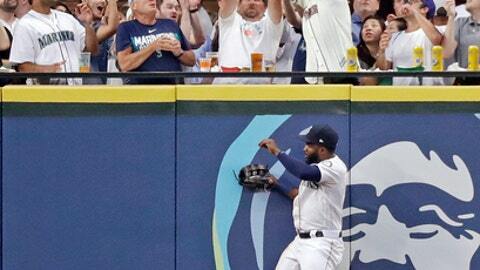 Seattle’s offense was limited to Jean Segura’s solo home run and Mitch Haniger’s RBI single. Morton was pulled after the sixth, despite giving up just two runs and throwing 90 pitches. The sixth inning was the only time Seattle had multiple runners on base and Morton got out of the jam after Haniger’s single by getting Chris Hermann to ground out with two runners on. ”He pitched great. His command of his pitches was overall good tonight. Got some big swings and misses when he needed to,” Houston manager A.J. Hinch said. Hector Rondon pitched the ninth for his 10th save. Leake (8-7) escaped a bases loaded jam in the fourth inning, but couldn’t avoid giving up a run in the fifth. Leake left a 0-2 pitch to Reddick in the middle of the plate and his two-out single scored Tony Kemp. Gattis added his homer an inning later. Leake allowed eight hits and struck out four. He allowed three earned runs or more for just the fourth time in his past 13 starts. ”Felt good (early), I was mixing and matching and kind of keeping them off-balance, and then they got me a couple times,” Leake said. As if the Astros needed more injury concerns, Springer left the game in the second inning with left shoulder soreness. Springer fell awkwardly on the shoulder making a diving attempt to stop Denard Span’s triple in the first inning. He was replaced by Kyle Tucker. Springer said he received treatment throughout the game. ”It just didn’t feel right. I know when it feels right and I know when it doesn’t. Got some stuff done during the game and again we’ll see what happens tomorrow,” Springer said. The Mariners ended July scoring just 77 runs in 23 games, an average of 3.3 runs per game. It was a drastic drop over June when the Mariners averaged 4.5 runs per game and went 19-9 overall. Segura’s homer was his eighth of the season and Haniger was in a 2-for-26 skid before his RBI single. ”We just haven’t been able to put big numbers up there. We’ve had innings here and there, but it’s going to take everybody contributing, it’s not just one guy to go up there and hit the big three-run homer,” Seattle manager Scott Servais said. Astros: Houston SS Carlos Correa went through a full pregame workout on Tuesday including hitting and fielding during batting practice. Correa also did an extensive running program as well. Hinch said if all goes well Correa could go out on a rehab assignment as early as Thursday with Double-A Corpus Christi. Correa has been out since June 26 with a back injury. … 2B Altuve joined the Astros in Seattle, but will simply be doing rehab work the next few days on his injured right knee. Hinch said it would likely be in Los Angeles before the team tests Altuve with any baseball activity. Mariners: LHP Roneis Elias was placed on the 10-day DL with a strained left triceps. Servais said Elias felt the arm start to bother him last weekend in Anaheim and an MRI revealed the strain. Astros: Dallas Keuchel (8-9) has gone 5-1 with a 2.16 ERA over his past eight starts. He had won five straight before losing to Texas in his last start. Mariners: Wade LeBlanc (6-1) looks to continue his career-best season. LeBlanc got a no decision in his last start against the Angels. He’s made one start this season against the Astros, allowing three runs in four innings in a no decision in June.